Every Saturday, I host a feature called Kid Konnection -- a regular weekend feature about anything related to children's books. This week, I'm going to share with you "one of the coolest books ever" according to my husband and son! Summary: Kids love origami—and what could be cooler than transforming a piece of paper into Boba Fett, Princess Leia, Yoda, or R2-D2? And not just any paper, but custom-designed paper illustrated with art from the movies. Star Wars® Origami marries the fun of paper folding with the obsession of Star Wars. Like The Joy of Origami and Origami on the Go, this book puts an original spin on an ancient art. And like Star Wars® Scanimation® and Star Wars® Fandex®, it’s a fresh take on Star Wars mania. STAR WARS ORIGAMI: 36 AMAZING PAPER-FOLDING PROJECTS FROM A GALAXY FAR, FAR AWAY... by Chris Alexander is the perfect gift for the Star Wars fan in your life. I just happen to have two that actually live with me, and they were blown away by this book. This book contains step-by-step instructions for preparing 36 different Star Wars origami projects including a Yoda, a Darth Vader, the Death Star, a Millennium Falcon, and even a Han Solo. 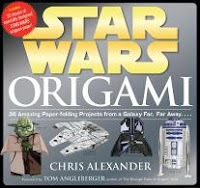 The foreword of the book is written by Tom Angleberger, author of THE STRANGE CASE OF ORIGAMI YODA. Normally, I wouldn't mention who wrote the foreword of a book; however, I'm a huge fan of his middle grade novels -- my review. In addition, I was lucky enough to meet him at last year's BEA and he actually gave me an origami Darth Vader that he made. I had great plans that I was going to make some Star Wars origami projects and take photos to go along with this post. Needless to say, things didn't work out quite like I had planned. I sat down with this book and began by reading the basic origami instructions. The author begins with general origami definitions, symbols and basic folds. These seemed fairly simple and clear to me, so I decided to pick a project. The paper-folding projects in this book are all amazing and I had a great time looking at how each one was prepared! I pretty much decided that they all looked too difficult for my abilities, but since they are classified by difficulty, I decided that I could probably do a Youngling one -- those are considered the easiest. The next levels are Padawan (medium), Jedi Knight (difficult) and Jedi Master (tricky!) See, everything about this book is awesome! Rather than using the patterned paper that is provided in the back of the book (oh yeah, did I mention that this book not only has instructions but also the coolest Star Wars paper ever? ), I decided to try it with regular paper first. I had a feeling that origami might not be my thing. It's a good thing I did this or I would have ruined some very nice paper. Origami is hard... even at the Youngling level. Having said that, I know I could make some of the easier items in this book if I stuck with it. Furthermore, I have no doubt that most kids (ages 9 and up) could figure it out with few problems. The instructions in this book are good... very good, in fact. I just think I'm a little slow to figure things like this out and I didn't want to wait to post my review until I acquired some origami skills. In addition to the instructions and the patterned paper, there are also a few other things in STAR WARS ORIGAMI that will appeal to Star Wars fans. First of all, there are descriptions of the famous characters and ships prior to the origami directions. There are also a few Star Wars quizzes and trivia thrown in to test your Star Wars knowledge. Finally, I want to mention that Chris Alexander, the creator of all things Star Wars origami, has a great website that you have to visit. He has posted some of his Star Wars origami creations with instructions. While you don't actually have the very cool Star Wars patterned paper that comes with this book, there are still some fun projects using just regular paper. Despite my lack of origami skills, I am still saying that STAR WARS ORIGAMI is a fantastic book. Highly recommended for Star Wars fans and anyone who wants to learn (or build upon) origami skills. I know Vance would have loved this book when he was younger and would probably still love it! He's loved Star Wars forever and was in the Origami Club in middle school in Charlotte. I would have loved this when I was a kid. Would likely love it now! It's great that the paper is included in the book. Note to Kathy: Origami Club? What a cool idea. I know a ocuple of kids who might really enjoy these projects. Thanks for sharing.